Don't attempt your annual spring clean without checking out these gadgets - they could make the job much easier. It's that time of year when many of us think about getting around to giving the house a good, thorough spring clean - not the most exciting of jobs but one that's pretty much essential if you want to keep on top of the dust, dirt and grime that regularly builds up. Fortunately, modern-day technology can help. 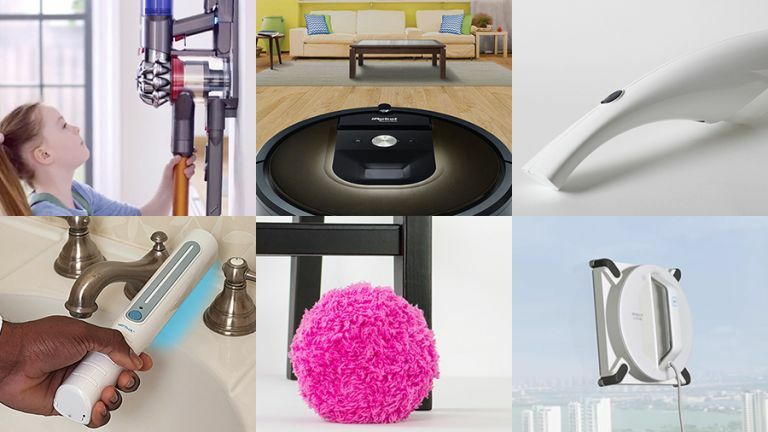 There are more gadgets than you might think out there to aid you in your spring cleaning, from robot vacuums that can hoover up while you're at work, to portable scanners that can make short work of your paper pile. If you're going to buy a new vacuum cleaner to celebrate (?) the arrival of spring cleaning season then you can do a lot worse than the Dyson V8 Animal. It's more powerful than its predecessor the V6, and can keep going for 40 minutes on a single charge rather than 20. That means you can probably get around most of the house or at least a good number of rooms before having to return back to base for a charge. On top of that it's lightweight and easy to carry, and is equally happy dealing with hard surfaces as it is with carpeted floors. Of course you don't have to do all that vacuuming yourself if you don't want to - something like the iRobot Roomba 980 will do the job for you while you're out of the house, running for 120 minutes before it has to recharge (which it also does on its own). You can control your cleaning bot completely from an app on your phone, scheduling cleans for specific times if you need to, and it can navigate around multiple rooms too. The only real downside is the price, but shop around and you'll find some decent deals. Maybe you're looking for something a little less powerful and expensive than the Roomba 980, in which case the Mocoro Robot Cleaning Ball can help. Hailing from Japan, the cute-looking cleaner is a robotic duster that roams around your floors independently. It hasn't quite got the AI-powered nous of the proper robot vacuum cleaners - nor the cleaning strength - but it is clever enough to change direction when it hits something, and it'll attract dust and dirt along the way. As an added bonus it keeps your cat entertained. Windows looking a little drab? Let the Winbot 950 loose on them, the latest window-cleaning robot from Ecovacs Robotics, a company we've bumped into plenty of times at trade shows over the last couple of years. It's the firm's best cleaning bot yet. Once suckered to your window, Winbot 950 can find its way around your panes of glass, cleaning them to a sparkling finish every time, thanks to a four-stage cleaning system and a suction fan. The included power cable has a reach of five metres or around 16 feet. This portable wand uses the cleaning power of ultraviolet light to keep your surfaces germ-free, and according to its makers, the device is capable of cleaning up to 99.9 percent of germs on hard surfaces, with no extra chemicals or irritants required. While the science behind these devices may not be as impressive as some claim, the general consensus is that they do kill off some germs in some cases, so they're certainly better than nothing. They're cheap and lightweight too, and easy to operate anywhere. Cleaning the toilet isn't the most pleasant of chores but the Loogun makes it slightly less icky by ensuring you don't actually have to touch the lavatory itself, with or without a brush - instead it uses finely targeted streams of water to clean every part of the bowl. There are no splashes to mop up, there's nothing to clean, the patent-pending design is easy to refill from the tap, and the device is kiddy-safe as well. The Loogun is powered by four AA batteries but you should only have to change them every nine months or so. While you'll understandably be concentrating on the visible dirt and grime in your home during your annual spring clean, don't forget the quality of the air you're breathing as well - it could have more of an effect on your health, but it's nowhere near as easy to clean up. The PureMate PM 520 Air Purifier is one device that can help. Its advanced filtering system is good enough to capture 99.9 percent of airborne particles, and it's not just for spring either - it can benefit asthma sufferers and ease pet allergies the whole year round. Admittedly not the first gadget you think of when it comes to spring cleaning, but a portable scanner like the Doxie Q can make short work of all the paper taking up room in your house, digitising your documents and giving you more room for your other stuff. You might already have a scanner that you never use for going paperless but the fact that the Doxie Q is compact and wireless means you can power around your house scanning in as many documents as you can find, all of which get sent back to your computer instantly.